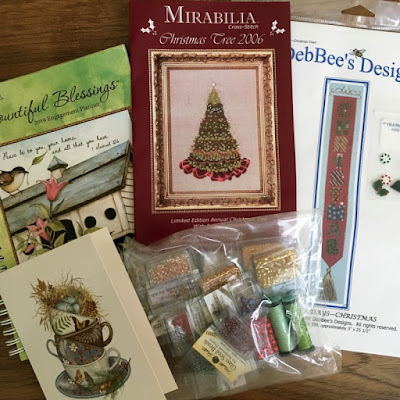 Well, all I can say, is I wish everyone could feel the sense of love and the spirit of kindness that I experienced when I read through your wonderful comments on my Stitching Dreams 10th Anniversary post. Your thoughtful and heartfelt messages really got to me--a few even brought tears to my eyes. I've said it many, many times before, but I truly believe the cross stitching community is the most supportive group one could ask for. Don't you agree? I mean how nice is it to have an online community that actually builds each other up, encourages each other, and is there to offer support or a shoulder to lean on in times of need? Aren't we the lucky ones? Thank you, one and all, for taking the time to leave your comments... Whenever I'm feeling low, all I'll have to do is scroll through the comments from that post and I know they'll instantly make me smile! I've been doing a little pink and red stitching in honor of Valentine's Day... I'm sure you'll all recognize my first finish as a Lizzie Kate design. This is "A Little Love" and is stitched on 40 ct. white Newcastle linen with most of the suggested overdyed threads. To finish it off, I added a few pale pink beads to the flowers and the middle of the letter "L," and used a few trims to embellish it. Layering the trims on a little pillow like this makes such a difference, don't you think? And, although I'm really not much of a "pink" girl, this sweet freebie turned out so cute. It is from the Italian blog Cuore e Batticuore and is available right here. This one is stitched on 40 ct. antique white Newcastle with the suggested DMC threads and is a perfect example of a piece where the finishing took longer than the stitching! Again--note all the layers. For someone who doesn't really like pink, this one is actually growing on me! My final Valentine's finish is something I am truly proud of because it really wasn't charted as a Valentine's piece at all! Over the past few months, I've fallen in love with the charming children from French designer Perrette Samouiloff and decided I wanted to have a Valentine's piece featuring them. 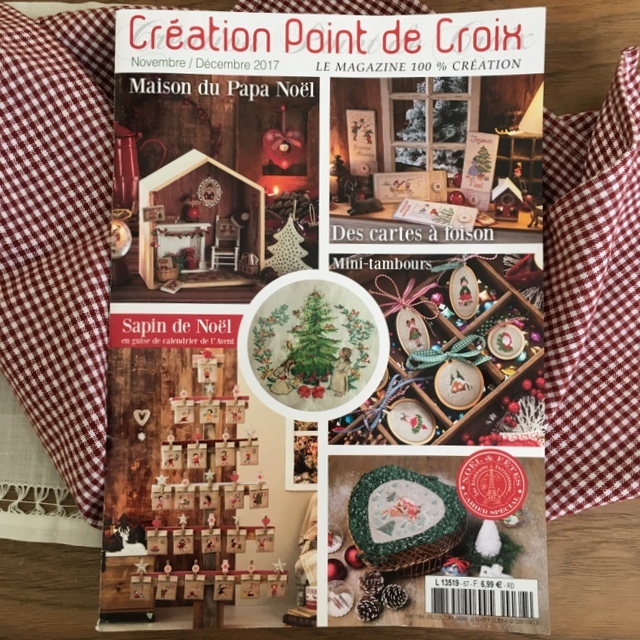 My French blogging friend, Nathalie, has sent me several French cross stitch magazines in the past and the two children I used in my finish were taken from the November / December 2017 issue of Création Point de Croix. The children were actually charted to be part of an Advent Calendar featured in this issue. Here is a photo of it shown below... I had only one year of French in college so it's a bit hard to read the magazine (who am I kidding--I can only make out a few words!!) but, luckily, the language of stitching is universal! 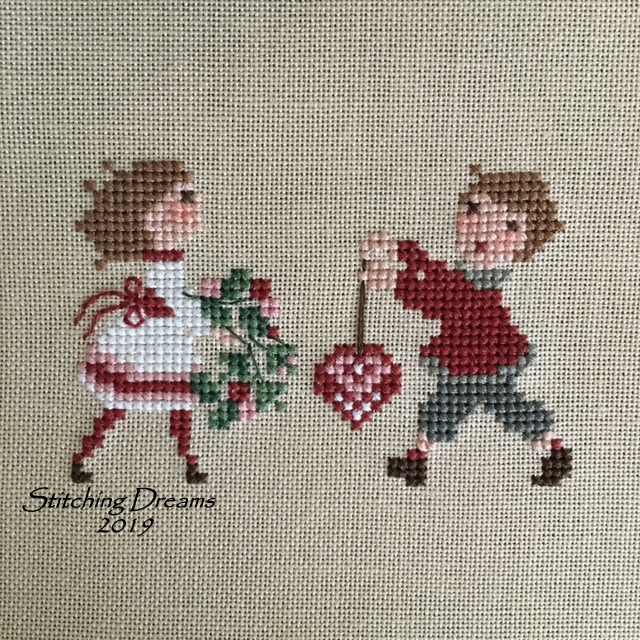 I used the charts of the girl from Day 10 and the boy from Day 16 (stitched in reverse so he faces his sweetheart--simply take a photo of the design in a mirror to reverse the chart and make stitching easier!). I changed every single suggested color because there were too many orangey reds for me. My tip for changing colors is to simply turn to your favorite designer. Have you ever noticed that most designers tend to design within a certain color palette? 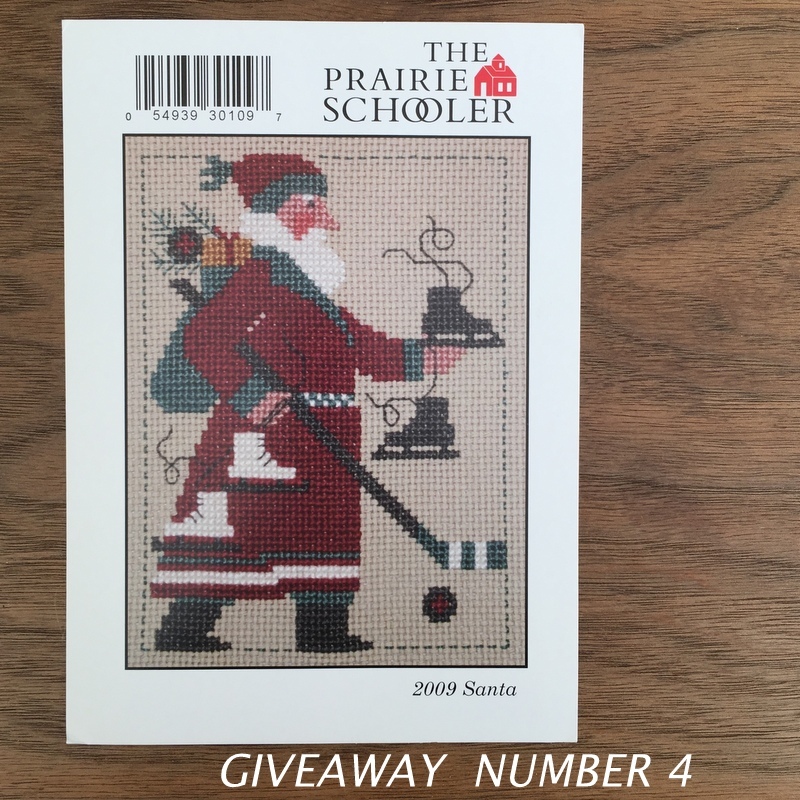 Well, you all know my favorite designs are from Prairie Schooler so, voilà--I converted everything to those colors and am so pleased with the final result! This is stitched on 32 ct. bay rum jobelan with all DMC threads. Two Perrette Simouloff children in Prairie Schooler colors! Birthday cards and flowers from family and friends helped brighten my mid-January birthday! I received birthday gifts from two dear blogging friends, June and Cindy. You two have been such wonderful friends throughout my blogging years--thank you each so much for your thoughtful gifts, but thank you even more for your continuing friendship! Birthday gifts from June in England included charms, ribbons, bookmarks, and notecards! Birthday snowman from Cindy in Tennessee. I love the little checked scarf that Cindy embroidered with my initial! And from a very sweet friend, Barb in Michigan, came two charts that she wanted to pass on to me as she had purchased duplicates (I'm glad I'm not the only one who does that!). Thank you so much, Barb--I will be sure to pass these along when I'm done stitching them! My brother and sister-in-law took a trip to Arizona last fall and brought back this southwest themed kit for a miniature rug as a gift for me. I was so touched--and very surprised! Thank you both for feeding my stitching addiction! GIVEAWAY WINNERS... I both love and hate this part! I love giving things, but I truly wish I could give each of you something. At least, five stitchers will be happy and I'm thrilled to know that these little gifts will be flying all over the world to both bloggers and non-bloggers alike. Congratulations to all! Please contact me (my email is in the "A Bit About Me" in my sidebar) with your mailing addresses and I will get these out to you as soon as possible. Thanks to all who entered--and if you didn't win this time, please know I will be having future giveaways... So without further ado, the winners are as follows. So, do you celebrate Valentine's Day? We keep things pretty low-key here--exchange cards, eat chocolate, and if I'm lucky my husband brings me some cheery flowers. I wanted to make a special dessert for Valentine's week when my middle son and his girlfriend were over for their usual dinner this past weekend. So, when I spotted a perfect sounding recipe in the Sunday morning paper, I was delighted. I mean what could be a better combination than chocolate and raspberries? The recipe for this Chocolate-Stout Vinegar Cake With Raspberry Coulis can be found right here. It was quite good, although the cake was a bit dry for my taste. I didn't have the suggested 8" round cake pan so I used a 9" and forgot to adjust the baking time so that could account for the dryness. But, hey--plop enough whipped cream and raspberry sauce on and the cake moistened right up! The best Valentine mom could ask for! 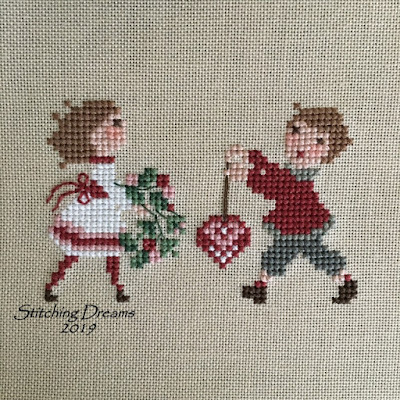 My favourite Valentine's stitching is the one in your header right in the middle with the month of February, the heart and the little envelope! Lots of charming stitching, as always and a wonderful birthday mid-January by the looks of it! Your mum looks wonderful and so happy with her first great-grandchild! First, happy belated birthday.....you received some lovely and thoughtful gifts. Love your header and new Valentine additions..so sweet! Congrats on the new addition to your extended family..your Mom and great grandchild are both precious! I'm early for a change! lol! Belated happy birthday! I was born in the summer, but believe me, sometimes that is a tough time too -- too hot! lol! I think spring or fall are the best times for a birthday myself! Anyway, I love all your Valentines stitches. When I was stitching, red was the color I gravitated toward. Somehow with knitting, mauves and pinks are what I'm liking. lol! Congratulations to your mom and to your niece and her family on the new baby! And to you too, of course. I think your mom is just a couple or three years older than my dad. She definitely looks happy to be a great grandmother! Happy belated birthday! What a lovely collection of cards and gifts and such a beautiful photo of your mum and her great grandchild!! Love your stitching and finishes, especially the one by Perrette . I'll have to at her designs. Cute stuff! Happy birthday! Carol... happy birthday 🎁! I join you in May! What lovely gifts you received! And your pretty pink stitches are precious! I love the new designer you found! I am looking forward to Market and seeing some new designs. However I am making myself finish some WIPs before starting anything new! Happy Belated Birthday, Carol! Both of your Valentine finishes are pretty, They will be a nice addition to the Valentine pieces in your header photo. I love to stitch, but I am lazy about finishing. I'm feeling inspired right now after seeing yours! The picture of your mom with her "great grand" is beautiful. Such joy! Another wonderful Carol post. So full and so many beauties to enjoy. Let's see...I love your Valentine finishes. I JUST learned to use my new sewing machine and I can't wait to try the trim on the side kind of finish you do. I LOVE the added layers you put. Such a perfect beautiful touch. I have an idea how to do it. Just need to try haha. The French finish you did is just too perfect. It's only for you too since you created it. The finished ornament is another perfect finish of course. Just looks meant to be! Glad you had a happy birthday. Great gifts. Congrats to the winners. I'm so happy I won that beautiful snow faces chart. I will email you right away. Yes we celebrate Valentine's Day. My son wants a new Xbox game that is coming out. So I told him it will be his gift. Hubby and I are going to our cabin Saturday night just the two of us to have alone time. This doesn't happen very often so that will be very nice indeed. Your cake your made looks yummy. How sweet the pic of your mom is. She is definitely a proud great grandmother. Have a great Valentine's Day. You deserve it! Your mother indeed is lovely! Tucker has certainly put some giddy up in my mother who will be 84 next month. I love that free stitch so much, and you did a lovely job on that. I am tucking that one way for another day. The boy and girl were just perfect for you. That is about as cute a thing as I have seen. I agree with you about the stitching community being so supportive. I have learned so much from others. Your blog never bores me. Happy Valentine's Day Carol! Love the Lizzie Kate - I happened to just buy this pattern last weekend at my LNS! Oh that picture of your mom is fabulous! I remember my grandma held our son when he was just hours old and she was THRILLED. She said she had never even held her own that soon after birth! Well Happy Belated Birthday Carol!🤗 I adore your new pink finishes! And I love all designs by Perrette Samouiloff. Your little piece is just darling. What wonderful gifts you received. I just love the picture of your mom. Happy Valentine's Day to you my sweet friend! Congrats to the winners! I'm not much of a pink person either but all your Valentine's finishes are just so pretty. My birthdays are pretty low key too and is 5 days after yours. My daughter took me to dinner, baked me a red velvet cake (my favorite), and took me to Home Depot to buy supplies for a garden this year. For Valentine's I buy myself a heart with chocolate but that's all the celebrating I do! Happy Valentine's Day to you, too, Carol! What beautiful finishes and such lovely photography as well. Love all your special trims and charms. I always get such great ideas from your posts:) Thank you! The picture of the chart in a mirror is brilliant and the way you added the beads to the flowers adds so much more to the design.I also love the buttons you've added to the celtic knot Prairie Schooler one in your header. It's always an inspiration to see your finishes. So special to see your mom with her special bundle of joy. Wishing you lots of February love and may the kindness and sharing you give be returned to you tenfold. Your mum looks fabulous indeed! And really happy to be holding her great-grandson. Belated birthday wishes to you and happy Valentine's day! Oh my Carol just love this post full of love . Love the pink stitching and finishing you make everything look so beautiful. Love the photo of your mother and love the sweet baby ,your mom looks so happy. Congrats to all the winners . What an uplifting post thank you , have a great week. Carol: Happy Belated Birthday, I too have a birthday in January, I too always wanted a warm month birthday. Your Mother is positively adorable, she looks young not at all like 92, how lucky she is to have a great grandchild. You should do finishing work on needlework you do such a beautiful job coordinating colors and fibers. I love French designs, they are sometime hard to get over the internet. Stay warm it is a balmy 10 degrees right now here in my little town in Minnesota. Carol, such a beautiful blog post! I agree with you completely that cross stitchers make up a very edifying community and It's a blessing to be among them! 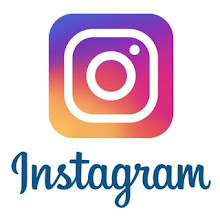 Thank you for all of the inspiration in your photos and commentaries here. I can tell you for a fact there are not enough hours in my days to do all the stitching I want to do, and your blog posts just add to it!!!! Valentine's Day -- this year we are low key just because we've had company and have been packing and we're just kinda tired. We'll have a nice dinner at home, just the two of us, and thank the Lord for our love and marriage (oh yes, and the kids and g-kids, too!). Speaking of family, that picture of your mother with her first great grandchild is wonderful!!! Happy Belated Birthday! Great Valentine stitching. Valentine's Day is low key for us as well. We will have dinner at home and then will go out sometime the following week. Your finishing is always exquisite! Carol...Your mom DOES look fabulous! Belated Happy Birthday...you received some great gifts. And your stitches are darling...I need to stitch more smalls so I can have a feeling of accomplishment! I am so happy for your dear Mom. What a joy that must be and yes, you can see it in her face. I agree about the blogging community. I have gotten hooked on flosstube and I feel the same about that community. I love those Valentine designs. I am not a pink person either but you make it look great! The little children are just adorable. To me, they look like a vintage post card, plus the colors you chose are perfect! A Happy Valentines Day to you. We are taking our DD out for lunch as she is in the 4th snow day. It has been very bad here and we don't have the plows to take care of things. What beautiful Valentine stitching you have Catherine! I don't know which one I love more as they are all wonderful but I think I am leaning towards the one you created yourself using those adorable children. Congrats to all the winners and I think whoever got a slice of that cake was also a winner. It looks yummy. Your great nephew is a cutie and your Mom looks so happy to have him in her hands! Oh no, I forgot something important! Happy belated Carol! Lovely gifts, hope to see that tree. Hope to have a piece of that cake too and that may be this weekend. Really nice work on the children, so sweet! And so glad you added a photo of your beautiful mom, what a wonderful smile of joy! Carol, your Valentine finishes are so beautiful. Each of them is made with perfection. Wow converting a advent design to Valentine piece, you are so clever.Thanks for the tip on making a pattern reverse. Belated happy birthday...you are loved by your friends . Congrats on the baby, your mom looks so happy. About celebrating Valentine's day, it was more a thing in my 20s ,today I even forgot its Valentine day. I just feel blessed to have a partner with whom everyday feels like Valentine day. Happy belated birthday Carol. I hope it was a wonderful day for you. You received such lovely gifts and I know they were well received. I just adore that second finish with the free stitch. It is darling and the finish is perfect for it. I've been going over in my mind a neat finish for my French village and the idea I like a lot is very similar to that finish. But finding the right trim may be a problem. The other two stitches are wonderful as well and equally finished beautifully. Love all three. Your Mom is a doll and she must be over the moon to have her first great grandchild. Your little "Love" pillow looks cute, especially the lace and ribbons that you use for your work, I find very nice. And how cute the ornament is with the kids - you're really very creative. And each of your parts has a great finsih. That inspires me a lot. Afterwards I wish you all the best from the bottom of my heart. You got very nice presents. Your mom is a happy, not everyone is lucky enough to become a great-grandmother. You can see her joy. Your stitching finishes are so adorable as always. I love them all. The girl and boy are so cute together. Your are very creativ. Happy belated Birthday. Wonderful gifts arrived. 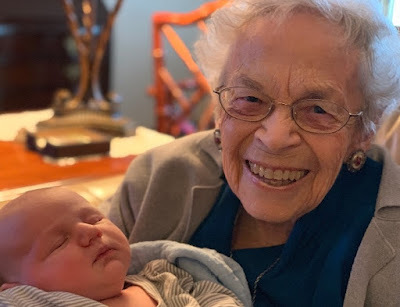 Your Mom is very happy with her first great grandchild. Happy belated birthday from Germany. Congratulations on the baby, your Mom looks so happy. Can't believe she 's got that age. Your stitching is again as wonderful as ever. Love your header and love the little pillow on the left. The pillow from Batticuore, I really don't know how many I have stitched. It's really a beautiful design. Have a happy day and greetings. Valentine's day somehow sneaked up on me this year and I didn't get around to doing any special stitching. Your finishes are just lovely, the trims really do make a difference. Love all of the Valentines on your header, so perfect & pretty! The new finishes are gorgeous too, and those French Kids! So cute! Looks like some great goodies you received. That rug kit.............so very pretty! That pic of your Mom is priceless, she looks great!! my husband and I just skip Valentine's Day because there's been advertising everywhere for weeks now. We're going to the theater tonight and my husband's taking me out to dinner. I wish you a really happy Valentine's Day, you celebrate it very extensively. The great-grandchild is so pretty, a beautiful Valentine's gift. I like all your embroideries very much, especially the two children with the changed colors, that I often do so. And also I will be 64 years old this year, in May, congratulations afterwards, you got great gifts. Juchuuuu, I won, thank you very much for the great giveaway, I'll send you my address right now. Qu'elles sont douces à nos yeux ces broderies pour la Saint Valentin ! C'est un régal de voir les finitions si belles également. Nous fêterons la Saint Valentin ce soir, en amoureux, avec mon mari. Je lui réserve un petit cadeau et un dessert au chocolat (mais sans framboises.. )..
J'ai également souhaité sa fête à notre plus jeune fils Valentin ! Votre anniversaire est mi-janvier, comme lui, il est du 16.. et moi du 30, où j'ai pris 54 ans. Je vois que vous aimer les personnages de Perrette Samouiloff. Elle fait de jolis modèles. Bravo aux gagnantes, vous allez être ravies par ces cadeaux si gentiment offerts. I love the way you finished each one of your valentine pieces. Happy Birthday to you and yes, your Mom looks fabulous! Your mother looks so happy and pleased with the new family addition... what a wonderful smile she has. Pretty LOVE finish and how clever you are to whip up the little girl and boy so prettily. Happy belated birthday Carol! your finishes are all so beautiful. How clever of you to convert the colours of the Valentines kids to your favorite palette, the result is really pretty. Congratulations to your mum, she does look fabulous!! Carol, Happy Birthday to you! I know winter birthdays can be tough, but believe me, summer ones are much better! Way too hot for fun when you're born in June! You've chosen such wonderful Valentine projects! As always, I love anything Lizzie Kate! And, those two children are precious! Something else that's precious is that adorable baby and your beautiful mother! Congrats to your family! Your mom has the best smile! You can tell she is thrilled to have another baby in the family! Happy belated birthday! I'm a January baby too and after the hustle and bustle of the holidays, I always prefer something very low key! Beautiful stitching finishes and gifts. Happy Belated Birthday Carol. You have received some lovely birthday gifts. Your finishes are beautiful and perfect as usual. The finishing is just as wonderful as the stitching. The smile on your Mum's face is truly magical, a proud great grandmother. Congratulations on your birthday, the wish of health and lots of xxxxx! Tout est magnifique! J'adore les détails des différentes finitions!! Bravo!!! Happy Valentines Carol! Love you stitching and your cover photo of so many heart/love smalls! The picture of your mom with the baby is just the best! You sure have some good genes in your family, I’d never guess she is in her 90s! Hope you have a great weekend! What lovely, loving, festive stitches! Happy belated birthday Carol! I hope the year ahead is filled with good health and much happiness. I just loved your beautiful Valentines Day cushions. Your finishing is so lovely. I love your blog and enjoy reading about your life, trips, etc. Have a great rest of February. Carol, your Valentine finishes are all fabulous. I love the little boy and girl pair you stitched especially. It looks like you had a marvelous birthday. I hope you had a wonderful Valentine's Day. Enjoy your week! I love your Valentine stitching. They look so pretty. Many nice gifts you sent. Subsequently I send you Birthday Greetings. Hope you enjoyed the your Birthday. Such a pretty Valentine pieces! The frebbie ornament is adorable, love it so much! The photo of your mother is amazing, it makes me smile! Hope you had a wonderful Birthday!! Happy belated Birthday!! Happy belated birthday, Carol! And congratulations to all of the giveaway winners! Carol, your stitching and finishing..... WOW. I mean...WOW. I first read your post shortly after you published it, but I have been thinking of how to tell you simply how impressed I am with your skills. 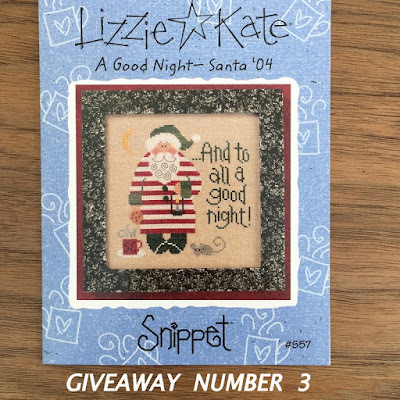 The layers are perfect, and I love, love, love that lace on the Lizzie Kate "Love" stitch. You inspire me. I seriously think you ought to work on a book about finishing. I know what you're going to say. "Oh, I just follow Vonna's tutorials and I practice." Well, that may be true, but you truly have an eye for what goes with what, and I would love to be in your brain while you are finishing something to hear your thought process. When I attempt to finish something, I approach it with, "I HOPE this works. What would Carol do?" Would be an interesting post if you went through your process step by step. Like, do you know how you're going to finish something before you stitch it? Do you shop specifically for a stitch, or do you try to stick with what you have on hand? Your mom looks great, by the way! Lovely smile. And what a sweet baby. Valentine's Day at our house is pretty low key. We go out for a nice dinner, usually the day before or the day after so we can avoid the crowds, and I like to make a sweet treat. This year I cheated and used a mix - King Arthur Flour's Molten Lava Cake Mix. OMG. So good. Almost tooooo much chocolate, if that's even possible. All these Valentine's ornaments are gorgeous - as usual, your finishing is just perfect! I love what you did with the two children, your colour selection works so well. Happy belated birthday - what wonderful gifts and cards! I agree, our cross stitch/blogger community is awesome, and the perfect pick-me-up on dark days as well. Hi Carol - oh, I’ve been trying to find a few minutes to read your newest post and then find a little time to tell you how much I love all of your wonderful stitching and all the fun stuff you share with us. 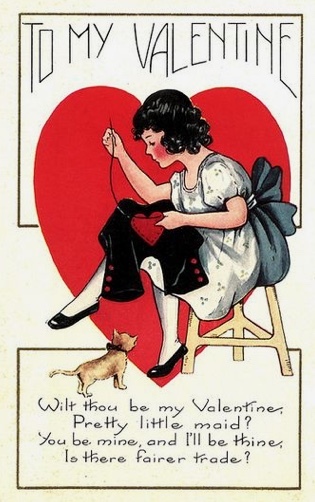 As all of your Commenters have stated, your Valentine stitching is just so wonderful and so creative! You truly never cease to thoroughly impress us with your beautiful workmanship. I love them all! and I was really intrigued with the French pattern that you photographed in the mirror to reverse the pattern. What a clever, imaginative idea! I think we all may keep that thought in the back of our minds in case we ever wish we could stitch something in a little different way. Thank you so much for sharing that clever idea! I truly loved the idea of changing the colors to what you preferred for the stitching too - as all of your work is so charming and beautiful. That Chocolate cake with the raspberry coulis looks pretty delicious too - perfect for Valentine’s Day! I hope all is going well for you and that you’re staying warm this winter. Our weather is finally improving a bit - not quite as cold as it has been lately. Makes it kind of hard to get a good dog walk in everyday. I think I must have found your blog around Valentine's Day because I remember the adaptation you did of Luli's "Love" (or is it Lovebirds?). And you posted the link to the freebie! I had to come back to see what else you stitched and how you finished it. Thanks again for continued inspiration. And enabling :)! That is such a nice picture of your mother and great nephew. I hope spring breaks out soon in western Pennsylvania; take care! Oh my, that's a lot of pink there! I think we can agree blue is the Superior Color (hides from Vickie-of-the-Poodles) but your new Valentine finishes are very sweet indeed. I really like that particular lace trim on the first one and the gingham-like fabric on the second. But your own personal one is super cute! The little children stitches are adorable (I totally noticed the one holding the cat straight away) and your modifications look great for Valentine's! Your mum just looks so thrilled to be holding her first great grandchild, her smile just says it all, certainly a photo to treasure. Happy very belated Birthday! I love your Valentine stitching, especially the Celtic Knotwork style ornie on the left of your blog header. Your adaptation of the two French children is adorable too. I much prefer the colours to the usual pink for Valentine! LOVE your pink stitching! All your finishes are beautiful. The photo of your mom and great-grandbaby is so precious.